Many times, parents of very young children don't think about handwriting skills. It's not typical to think about holding a pencil, writing words and sentences, and copying letters when children are just mastering building with blocks, learning to pull on socks, and creating finger paint masterpieces. But the truth is, when young preschoolers are playing, they are building the precursors to handwriting. The skills needed for managing a pencil, copying letter forms, and managing pencil control when copying lists and paragraphs into a space on a page are initiated in the early childhood years. Below, you'll find more about preschool pre-writing skills and the components of pre-writing skills that are developed through play. Preschool is prime time to develop the underlying skills needed for handwriting. So often, the older, school-aged kids that are struggling with handwriting are missing the underlying areas that make up the skills of handwriting. First, it's important to recognize that handwriting is made up of so many areas. From holding the pencil to moving and controlling the pencil when writing letter forms, handwriting requires a variety of motor movements that all must work together. Additionally, there are the eyes. 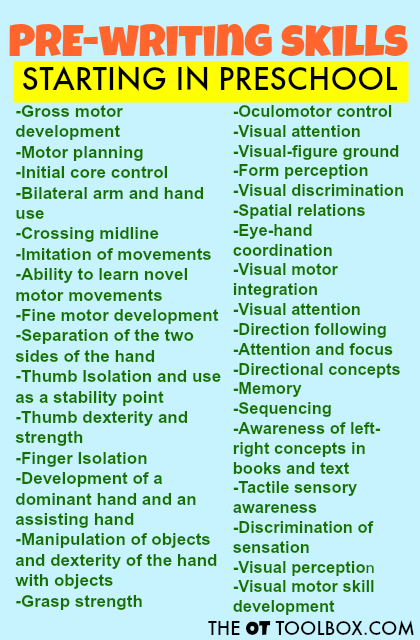 What is seen and recognized needs to be coordinated with the hand. 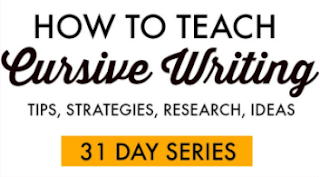 Visual processing has a huge component in written work! 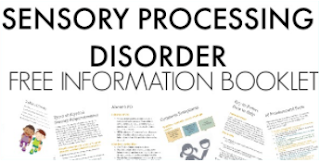 If any of these areas might be an issue for your child with handwriting troubles, consider grabbing The Handwriting Book as a resource that covers all of the underlying skill areas related to handwriting. 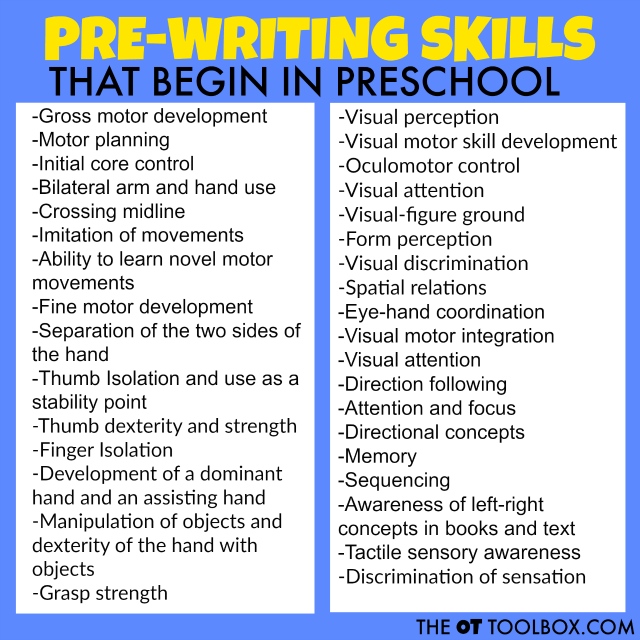 So how are all of these areas addressed as a pre-writing skill in preschool? The answer is through play! What makes up Pre-Writing Skills? Can you believe that all of these areas are being addressed through play in the early childhood development stages? And that all of these areas are building and developing with a resulting use in handwriting? Amazing, right? 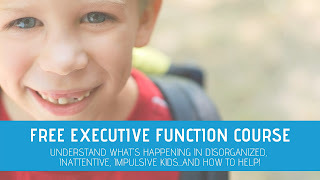 Stop by later this week to find out easy ways to encourage development of the above skill areas in group settings in the preschool environment. It can be difficult to address the needs of a preschool class when there are 16 four year olds that need reining in. I'll have easy ways to encourage development of fine motor skills, visual motor skills, and attention skills in fun and creative ways...coming soon! 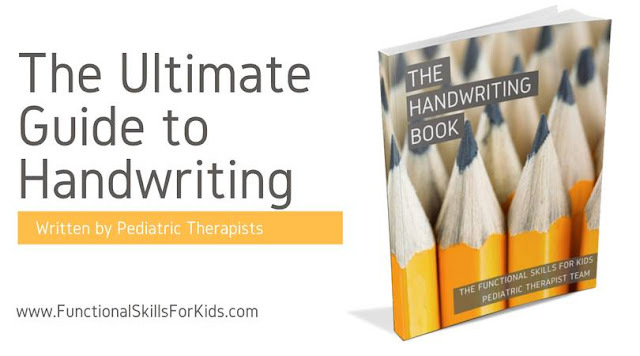 Want to know more about The Handwriting Book? 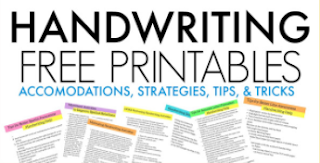 Click on the image above to find out how to address every underlying area related to handwriting skills.